Amid all the fun and extravagance of Priyanka Chopra and Nick Jonas’s wedding weekend, it might have been easy to miss some of the finer details that made their big days so uniquely, well, them. The couple, who wed at the Taj Umaid Bhawan Palace in Jodhpur, Rajasthan, over the weekend, managed to incorporate a number of tiny personal touches to their wedding outfits that paid homage to their two families in not one, but two ceremonies. On Saturday, Dec. 1, the pair exchanged vows in a traditional Christian ceremony officiated by Jonas’s father, Pastor Paul Kevin Jonas, Sr. Chopra, 36, wore a breathtaking custom Ralph Lauren long-sleeve gown featuring a hand-embroidered floral and scroll motif with lace-effect tulle appliqués with scalloped sleeves and a high-neck collar atop a strapless column dress. The body of the dress itself was made up of 2,380,000 mother of pearl sequins; the Quantico actress completed the look with an epic 75-foot-long tulle veil. In a sweet nod to Chopra’s now-mother-in-law and Jonas’s mother, Denise, a piece of Denise’s own lace wedding dress from her 1985 nuptials was stitched into Chopra’s elegant gown. (Chopra’s own mother, Madhu, walked her down the aisle; her father died in 2013). Additionally, the embroidery of Chopra’s gown featured a number of names and phrases that revealed the actress’s dedication to love and family—both hers and Jonas’s. For their traditional Hindu wedding ceremony Sunday, Chopra swapped gears (and colors! ), trading in her flowing, white Ralph Lauren gown for a traditional bright red lehenga: a long, embroidered skirt with a matching cropped top and veil. Indian fashion designer Sabyasachi, who created the look, sewed the names of her husband and her parents, Ashok and Madhu, were sown into the waistband of her skirt as a sweet personal touch. The outfit involved 110 embroiderers from Calcutta, India, and took 3,720 hours to create, on account of the hand-cut organza flowers, French knots in silk floss and many layers of thread work. “Every girl dreams of being a princess on her wedding day,” Chopra told People, reflecting on her big day. “But I never ha a plan about what I wanted it to be.” Luckily for her, Jonas thoughtfully suggested that they host two ceremonies in order to pay homage to both of their heritages and religions. 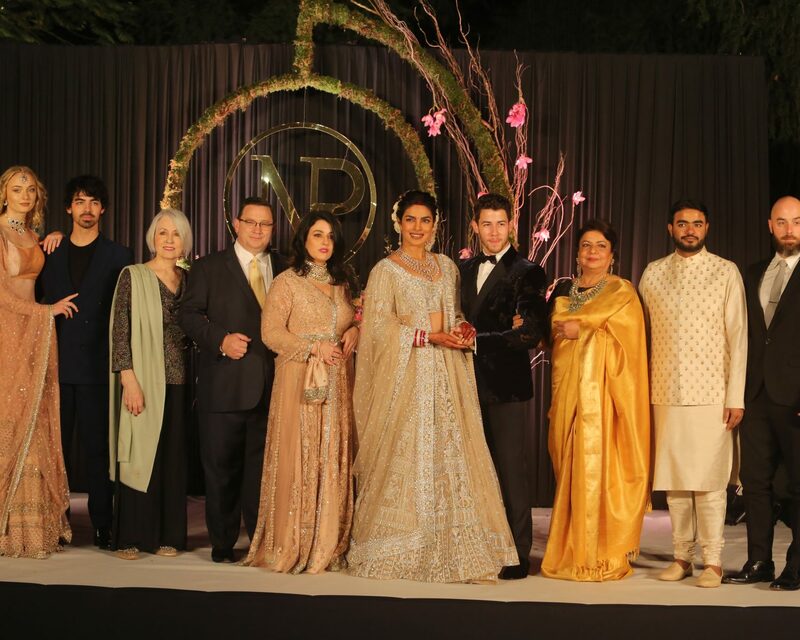 Be the first to comment on "How Priyanka Chopra and Nick Jonas Honored Their Families With Their Wedding: Details"